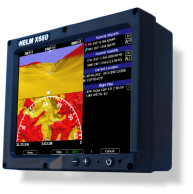 The Helm X650 is the first Panel Mount Open Architecture Aviation GPS system designed specifically for aircraft use. Running Windows allows the user to install and run the software of their choice. No longer is the pilot limited to the proprietary software of a hardware manufacturer. With the Helm X650 you are able to install, and run, in the panel of your airplane, any software that will run on windows. True Map, Chart Case, Anywhere Map, Mountain Scope, Symbolic Flight, and many other aviation programs are all available for the Helm X650. In fact, you could install all of them at the same time, and simply switch between the programs you felt like using at the time. In addition to aviation mapping software, the pilot can load and play Mp3 music, movies, or anything else that runs in windows. The X650 was designed, from the ground up, as a Panel Mount Aviation GPS. It fits neatly in the avionics stack utilizing a snap in mount that maintains the units portable status. 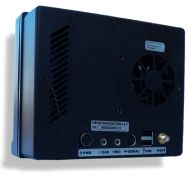 This allows the owner to install the X650 in the avionics stack of a certified aircraft. Remove that old Loran and ADF and install a state of the art gps. A log book entry by an A&P is all that is required. Connect anything that you would connect to a PC. A keyboard, mouse, trackball, DVD drive, Mp3 player, USB hub, printer, and most any other device that can be plugged into a PC. The options are only limited by your imagination. The Helm X650 EFB or Aviation GPS is a panel mount electronic flight bag efb panel mount gps for aircraft. This aviation gps/efb (electronic flight bag) mounts in the avionics stack, or panel. It is considered a portable aviation gps/efb (electronic flight bag) and requires no certification. This aviation gps/efb (electronic flight bag) has a built in gyro for highway in the sky and synthetic vision applications. 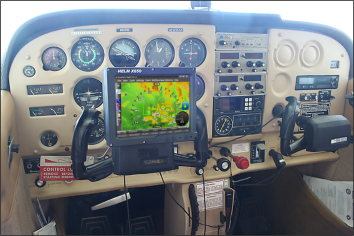 It is the first portable/panel mount aviation gps/efb (electronic flight bag) to offer synthetic vision or highway in the sky functionality. This aviation gps/efb (electronic flight bag) will run Anywhere Map, anywheremap, FlightPrep Chart Case, and Seattle avionics Voyager gps/efb (electronic flight bag) software.